Thyme deserves a place in all gardens. Its foliage is attractive, the long-lasting flowers are very pretty and it is a compact easy-care plant. On top of that it is one of the most useful herbs for the kitchen. 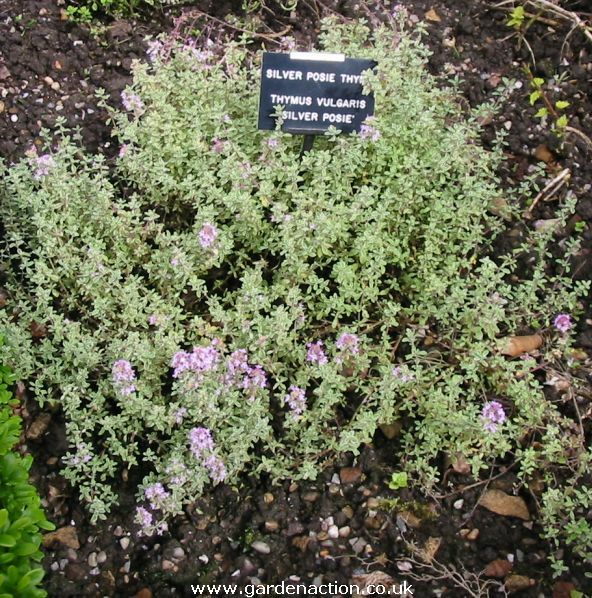 Thyme reaches a height of 30 cm (12in) and is best suited either to the rock garden or the front of a border. Sometimes it is grown between paving stones; it is highly aromatic and when trodden on its scent is intensified. A native of Southern Europe, thyme is now grown the world over from Africa to Russia - it proves it's versatility and it certainly deserves a place in your garden. 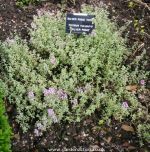 Thyme likes a well-drained light soil, it should not be too rich in nutrients which will only make the plant 'leggy' and loose its compact shape. Being a native of the Mediterranean it needs a place in full sun. Thyme can be propagated in a variety of ways - seed, root division and from cuttings. The best way if you have no existing plants is to grow from seed. This will however take about a year. The best way for speed is to grow from root division. Cuttings are not really recommended. Roots should be divided in April using plants three or four years old. Dig up the plant, clear away as much soil as possible from the roots and gently tear the the plant into three or four pieces. The pieces (each should have a portion of root and foliage) can then simply be planted in the ground and left to grow. They should be ready for moderate harvesting in early July time. Seed should be sown in March time in normal potting compost. Because the seeds are so fine, only cover them very lightly with the compost. Place them in a warm place, 16C (60F), and the seedlings will emerge in week or so. When the plants are about 10cm (4in high) and the danger of all frost has passed, they can be moved outside to their final position (harden them off first). They have a spread of about 30cm (12in) and should be spaced at this distance apart. Harvest only very, very lightly (if at all) in the first year. 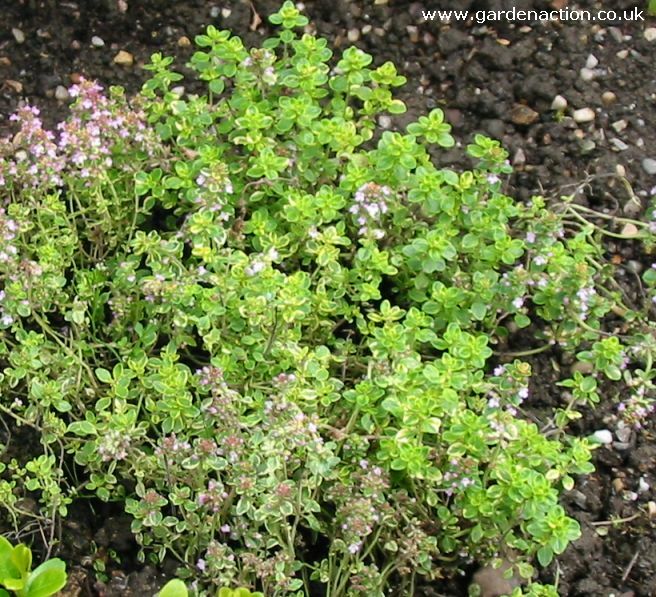 Thyme requires very little attention - water only in very dry conditions and feed sparingly. A good mulch with organic matter in October time will help protect them from severe frost and will also provide most of their feeding needs. If organic matter is not available, a handful of bonemeal per plant in mid-May and July will meet their needs. Thyme will start to become woody and produce fewer leaves after three or four years, and at this stage, the plant should be separated (as described in propagation above) and replanted. Harvesting can occur all year round, although the best flavour is in the months of mid-June and mid-July. In winter the plants stop growing, so harvest only lightly. The thyme sprigs can be frozen or dried - both methods retain the original flavour. Thyme is virtually free of pests and disease, although they are occasionally attacked by greenfly. Thyme is an excellent plant for growing in containers and requires no particular attention. Water to keep the compost moist, and feed with liquid plant food every two weeks from April to August. Choosing a variety of thyme is a matter of personal taste. However, for starters, shown below are a few tried and trusted varieties, all of which can be bought online by clicking (). Golden-scented Thyme (Thymus pulegioides) - slightly lemon scented thyme, great for cooking and with lavender coloured flowers. Garden Thyme Thymus vulgaris - the original thyme used for flavouring. Grown for hundreds of years. Thyme Thymus serpyllum - ground cover thyme, great for cooking and great for ground cover. Message: I live in austin,tx. It is very hot here. I bought potted herbs water them regularly but they tend to burn. Right now I bought new ones like Basil, thyme, Italian oregano, and mint (spearmint or peppermint I'm guessing). Can I keep these indoors? The apartment temp is 70 degrees air conditioning. any advice oh and i bought them already in the pot! thanks so much!!! I planted several thyme seeds in a pot.it sprouted in tiny stems but noticed thatthe stem rots when it is few centimeter tall, i watered to keep the soil moistened and also kept in full sun.i noticed all the young delicate thymes were vanished. I am planing to plant fresh. I live in a city where average day temperature is around 32 celsisus. Please advise. Message: I am in INDIA and wants to grow Thyme Herb in my garden. Kindly advise me how I can do it. Waiting for your advise. Message: we want to purchase oregano seeds. & thyme seeds or plant.please send us contects for that.